Some time in the fall of 1987, the 25 years old PhD candidate in computer vision at University of Michigan—Thomas Knoll, was trying to write a computer program to display grayscale images on a monochrome bitmap monitor. Because the program wasn't directly related to his thesis on computer vision, Knoll thought it had limited value at best. The program, called Display, Knoll wrote it on his Macintosh Plus computer at home. Little did he know that this initial code would be the very beginning of the real phenomenon, that would be known as Photoshop. Thomas was a son of Glenn Knoll, professor at University of Michigan, who lived with his family in Ann Arbor, Michigan. Glenn was a photo enthusiast, who maintained a darkroom in the family basement. He was also a technology aficionado intrigued by the emergence of the personal computer. His two sons, Thomas and John, inherited their father's inquisitive nature. And the vision for future greatness began with their exposure to Glenn's basement darkroom and with the Apple II Plus that he brought home for research projects. 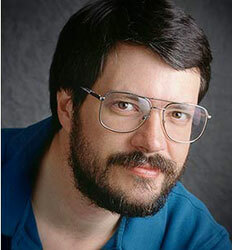 Even though Thomas loved hands-on darkroom work and developed film and made prints, he too had a keen interest in computers and programming. In 1987 he purchased an Apple Macintosh Plus, to help him with his Ph.D. work. Much to his disappointment, the Mac couldn't display gray-scale levels in his images. To solve that problem, Thomas wrote some command line utilities that did various imaging processing steps (e.g. to simulate the gray-scale effect, etc. ), before to tackle with something bigger, the Display program. When Thomas demonstrated his image processing tools to his older brother John, who was on vacation in Ann Arbor, he embraced the idea. John worked at Industrial Light and Magic (ILM) in Marin County, California. ILM was the visual effects arm of the famous film production company Lucasfilm, and John was experimenting with computers to create special effects. In the book CG 101: A Computer Graphics Industry Reference, John says: "Image processing is the fundamental basis of any of that kind of work, and Tom had written a bunch of image processing tools. As Tom showed me his work, it struck me how similar it was to the image processing tools on the Pixar [Pixar was a image computer John had just seen a graphics demo on at ILM]". Thus the pair began to collaborate on a larger, more cohesive application, which they dubbed Display. In the end of 1987 John arranged to purchase a new Macintosh II, the first color-capable model of the series, which cost almost 10000 USD. At the same time, Thomas rewrote the code for Display to work in color. In the ensuing months, the brothers worked on expanding Display's capability. At John's urging, Thomas added gama correction tools, as well as the ability to read and write various file formats, while John developed image processing routines that would later become filter plug-ins. Thomas developed also the unique capability to create soft-edged selections that would allow local changes and also developed such features as Levels for adjusting tonality, Color Balance, Hue, and Saturation for adjusting color, and painting capabilities. In the beginning of 1988 however, the project was closed to be cancelled. Thomas' fellowship money had run out and his wife was expecting their first child. Thomas was feeling pressure to finish what he was doing and find a permanent job. Fortunately, he decided to give himself six more months to finish a beta version and let John shop it around Silicon Valley. John thought they might have the basis of a commercially viable product, while Thomas was reluctant: "Do you have any idea how much work it is to write a commercial application?" he asked John. But with his naive optimism, John convinced Thomas it would be worth the effort. "I'll figure out how to make money with this," he told his brother. Well, John was right, but so was Thomas. It did take a lot of work, but hey will made a lot of money. The brothers decided to choose a more appropriate name for the product. The initial name—Display, was not appropriate anymore, because the program got more powerful, so they needed a name that would reflect what it did. The next working names were Image Pro and then Photo Lab (even PhotoHut was considered), but each of those were shot down in turn by similar products in that market space. When John started shopping around for a company to invest in Photoshop, travelling all over Silicon Valley, he gave program demos to number of companies, including a company named Adobe Systems. This will became a lucky strike. At his time Thomas remained in Ann Arbor, Michigan, fine-tuning the program, while John John kept pushing his brother to add new features, he even wrote a simple manual to make the program more understandable. John finally succeeded in attracting the attention of somebody, namely the scanner manufacturer BarneyScan, who decided that the program would be of use to people who owned their scanners. A short-term deal was worked out, and the first public iteration of the software was introduced as Barneyscan XP. About 200 copies of the program, now in Version 0.87, were shipped with Barneyscan scanners. Around this time, John demonstrated the program to engineers at Apple computer. It was a huge hit. Apple asked John to leave a couple of copies. There followed the first incident of Photoshop pirating. Seems that the Apple engineers shared the program with some friends, a lot of friends! Subsequently, John returned to Adobe for another demonstration. Russell Brown, Adobe's primary art director, was blown away by the program. He had just signed an NDA disclosure agreement with Letraset, to view their new image-editing program, ColorStudio. He was convinced that Photoshop was better. The whole Adobe's internal creative team loved the product. 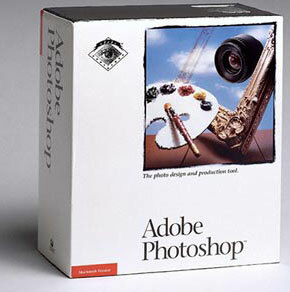 With a great deal of enthusiasm, Adobe decided to buy the license to distribute Photoshop. In the September of 1988, the Knoll brothers and Fred Mitchell, head of Adobe Acquisitions, made the deal with a handshake. It would be April, 1989, when the final legal agreements were worked out. The key phrase in that deal was "license to distribute." 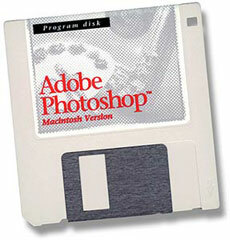 Adobe didn't completely buy-out the program until years after Photoshop had become a huge success. It was a smart move on the Knolls' part to work out a royalty agreement based upon distribution. 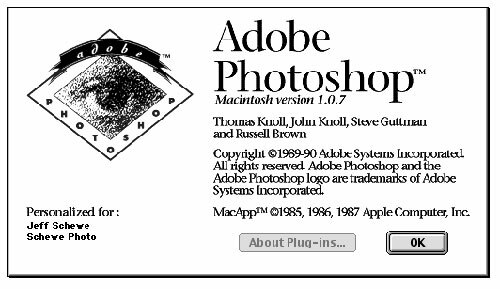 After the legal agreements were signed, Thomas and John started developing a shipping version—Adobe Photoshop 1.0, which was shipped in February, 1990, using a single diskette (see the nearby image). Adobe decided to keep the working name Photoshop, but not until an exhaustive attempt to find a better name provided nothing better. The first release was certainly a success, despite the usual slew of bugs. Adobe's key marketing decision was to present Photoshop as a mass-market, fairly simple tool for anyone to use, rather than most graphics software of the time, which was aimed at specialists. With Photoshop, you could be achieving the same things on your home desktop Mac that were previously only possible with thousands of dollars of advanced equipment at least, that was the implicit promise. There was also the matter of pricing. Letraset's ColorStudio, which had launched shortly before, cost $1995; Photoshop was less than $1000. Thomas wrote all the code for Photoshop in Ann Arbor, while John developed and wrote plug-ins in California. Some of the Adobe people thought John's features were gimmicky and didn't belong in a serious application. They viewed the product as a tool for retouching, not special effects, so John had to find a way to "sneak" them into the program. Later those plug-ins have become one of the most powerful aspects of Photoshop, which extended its functionality and act like mini-editors that modify the image. The most common type are filter plugins that provide various image effects. They are located in the Filter menu. Photoshop plugin API has become a standard, and many other image editors also support Photoshop Plugins. The second version of Photoshop, 2.0, also only for Mac OS, and was shipped in June, 1991. It introduced paths, CMYK color and EPS Rasterization. Until 1993 Photoshop was still a Mac-only application, but its success warranted a version for the burgeoning Windows graphics market. Porting it was not a trivial task: a whole new team, headed by Bryan Lamkin, was brought in for the PC. Oddly, although there were other significant new features such as 16-bit file support, this iteration was shipped as version 2.5. From this moment, all versions will be provided both for Mac and Windows operating systems, there are also several version for IRIX and Solaris. By general consensus, the addition of layers (together with Tabbed Palettes) in version 3.0, launched in November, 1994, has been the single most important aspect of Photoshop development, and probably the feature which finally persuaded many artists to try it. Yet the concept of layers wasn't unique to Photoshop. HSC (later to become MetaCreations), was concurrently developing Live Picture, an image-editing application including just such a facility. While an excellent program in its own right, Live Picture was vastly overpriced on its launch, leaving Photoshop 3.0 for both Mac and Windows to clean up. Version 5 (launched in May, 1998) introduced color management and the History palette, with its extra 'nonlinear history' behavior, which certainly opened up whole new creative possibilities. A major update, version 5.5, bundled Adobe's package ImageReady in an entirely new iteration, giving Photoshop excellent Web-specific features. Layer styles and improved text handling popped up in version 6 in September, 2000, and the Healing brush in version 7, in March, 2002. The latest version of Photoshop is 12.0 (called Adobe Photoshop CS5) was launched in April, 2010.